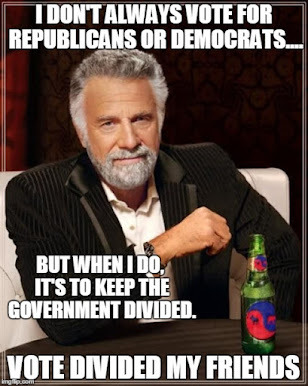 Since the Dividist abandoned the periodic "carnival" compilation of divided government punditry, we'll instead highlight any individual posts and articles we find that offers an interesting take on divided government. This may (or may not) become a regular feature. First up - Larry Franz blogging at Wherof One Can Speak and his lament "We Should Expect Divided Government For a Long Time"
Among the annoyances confronting those subscribing to a left-of-center worldview is the fact that the American electorate inconveniently continues to elect republicans to majority control in the House of Representatives. Liberals are fond of lecturing anyone who will listen that America is a center left country, that enlightened liberal democratic policies are better for all Americans, that republicans are on the wrong side of history, that shifting demographic favor a permanent democratic party majority, that republicans hate women, blacks, hispanics, gays, etc. etc. ad nauseum. And yet, despite the imparted wisdom, Americans continue to elect republicans into majority control of the House of Representative. Democrats have not clearly explained their superior policies (Lakoff framing). American voters are too stupid to realize that liberal policies are better for them. Republicans are more effective cheaters at gerrymandering districts. A right wing conspiracy hacked the voting machines and are stealing elections. It might be the case, however, that gerrymandering doesn't explain the Republicans’ success. That’s not to say the Republicans haven’t done their best to draw Congressional district boundaries to their advantage. They clearly did so the last time they got the chance and did it with more dedication than the Democrats." "... a recent study suggests that the Republicans have a natural advantage in House races. The reason could be that Democrats have gerrymandered themselves by tending to live in big cities, college towns and old manufacturing centers... A reasonable conclusion to draw from all of this is that Congress is even less representative than it seems to be. The Senate was explicitly designed to favor the interests of lightly-populated states, which now tend to vote Republican, while the House exhibits some favoritism toward small states, but more importantly is gerrymandered, whether on purpose or by simple geography, to favor Republicans as well." "Stipulated: Redistricting and gerrymandering are a corruption of the political process. But it's not new. And nobody does it better than Democrats. Even when California passed redistricting reform, the Democrats managed to game the supposedly non-partisan process to their advantage. 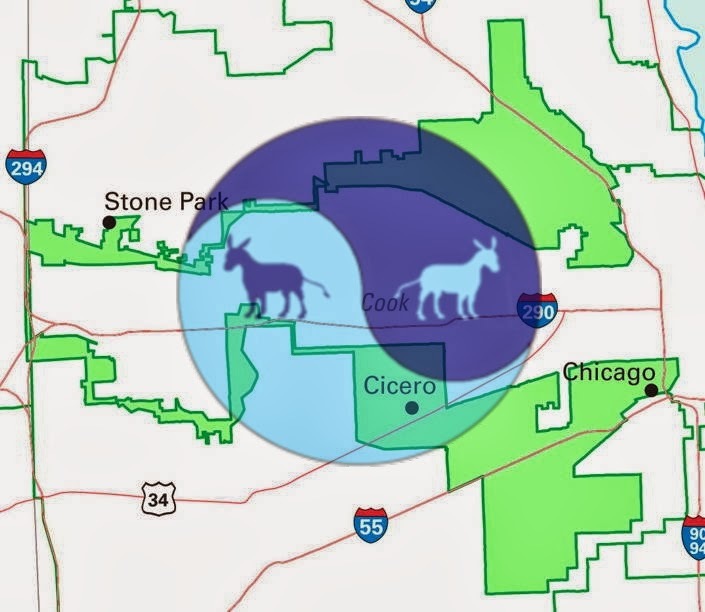 And as the Daily Show humorously demonstrated, the Picasso of the gerrymandering arts are the Democrats who created IL District 4. Democrats have effectively disenfranchised all Republicans in the greater Chicagoland area. So let's dispose of this absurd notion that the only reason America does not embrace its progressive future is due to a few illegitimately elected Republicans in the House of Representatives. If the Republican representatives are there because of redistricting and gerrymandering, so are the Democrats. There is no meaningful difference in gerrymandering scope or efficacy between the parties." "For example, by artfully dividing up Chicago into pie-sliced districts extending from Lake Michigan into the suburbs, the Illinois Democrats have done better for themselves than the outcome of our nonpartisan simulations. The Democrats have achieved something similar in Maryland. And in what will come as a surprise to many in the reform community, California’s redistricting commission produced multiple Democratic seats beyond the predictions of our simulations. Evidently the enormous and sophisticated lobbying efforts of California Democrats were successful." Net net... In the most populated, most heavily Democratic skewed states: in the NE corridor; in Illinois and in California - GOP voters have been gerrymandered into complete irrelevance. If truly non-partisan redistricting was possible on a national basis it is at least as likely to help Republicans as hurt them. The American electorate gave republicans majority control in the House because Americans do not want President Obama and democrats to have a free hand to implement their policies. They have no more interest in letting the democrats control both the executive & legislative branch than the republicans. 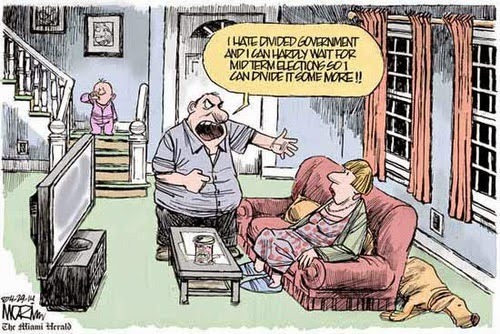 Been there (One party Democrat Rule in 2009-2010). Done that (One Party GOP Rule 2002-2006). Got the tee-shirt (Massive increase in spending, deficits, debt, erosion of civil liberties and never-ending elective wars). Hated it. Despite the power of a republican President in office, despite republican party gerrymandering, Americans elected a democratic majority in both house of Congress in 2006. Despite the power of a democratic President in office, despite democratic party control and gerrymandering in the most populous states of the nation, Americans elected a republican majority in the House of Representatives in 2010, again in 2012, and will again in 2014. For now, enough Americans remember that more bad than good happens when one party controls both the legislative and executive branches. Until that memory fades, they are likely to keep the government divided, just as the architects of our constitution intended. It's a good thing. The problem with gerrymandering is that creating districts where you have advantage inevitably also creates districts where you don't. The standard strategy is to create districts where you hold an edge, and to lump all the other guys into a few districts where they control utterly. In practice this tends to give you an edge in swing districts while creating some safe districts for the other guys. But swing districts can and will swing. People are mobile. Moods change. If you gerrymander to create safe districts for yourself, you hand the other guys swing districts instead. :) See above re: change. To your point, found this description of how the GOP probably lost a couple of seats in PA due to being too smart by half in "packing" Murtha's PA-12 district. From PJ Media - "The Top Ten Most Gerrymandered Congressional Districts in the United States"
PA-12 is a rare example of “packing” (jamming as many opposition voters as possible into one district) that backfired. This district was created to be a Democratic stronghold formerly held by Congressman Jack Murtha, who was assumed to have a lock on the district. At the last redistricting in 2000, the Republicans in charge gave up on the area, which is solidly unionized, and decided to “pack” Murtha’s new district with as many Democrats as possible, to allow the remaining districts in the region a chance to have slim Republican majorities. But in the intervening ten years everything has changed: the area grew more and more conservative, and the locally popular Murtha died, opening up the seat to possible challengers. In the 2010 election, PA-12 barely remained Democratic with Mark Critz winning by a hairsbreadth 50.8%-49.2% margin — while most of the surrounding districts overwhelmingly went Republican. Thus, if the foolish 2000 Republican redistricters had not consciously set out to create a “packed” Democratic district, and had instead just drawn the boundaries at random, they could have easily won all the races in the area, instead of losing this one (and the adjacent PA-4) by the slimmest of margins. Note to gerrymanderers: THINGS CHANGE. What may appear to be a wise gerrymander maneuver today may blow up in your face sometime in the future."